When I got married several years ago, I dreaded setting up a registry. I have multiple complaints about registries, but my two main problems were 1) I didn’t want to tie people to a specific store. I’m quite frugal and know that shopping around can really pay off and 2) I didn’t necessarily have specific brand/model preferences for things. For example, I knew we wanted a meat thermometer but didn’t really have the time to figure out which one to put on the registry. 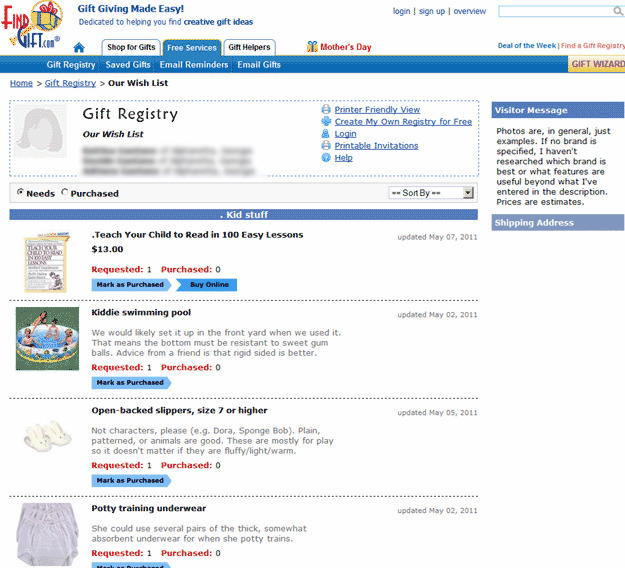 Enter http://www.findgift.com. 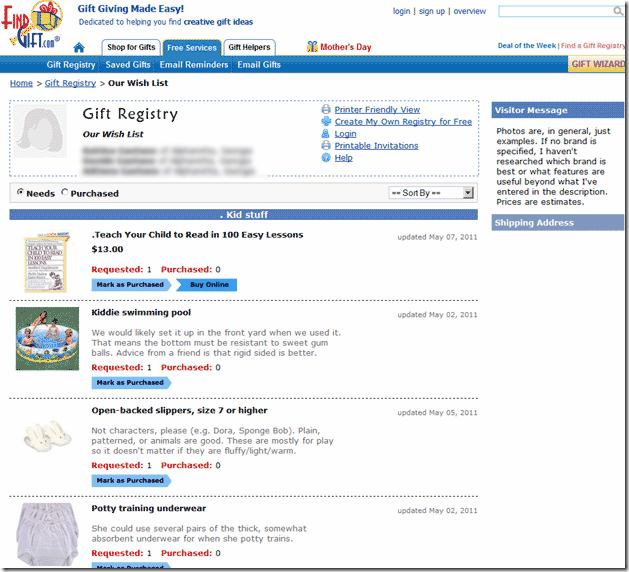 FindGift allows you to create an online registry that isn’t tied to a specific store and allows you to add items with as much or as little detail as you like. Actually, it allows you to create multiple registries if you want. 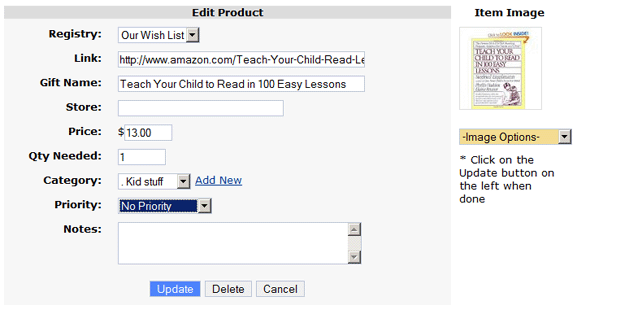 I maintain a general wishlist registry for our family. I could put each person as a separate registry, but I find it easier to have just one registry and use the category labels to delineate what items are for whom. Here’s a peek at my registry. As you can see, years later I still don’t like pinning down a brand/model. That Visitor Message on the right is my text. There are some other things you can add in that area such as event details (e.g. for a bridal registry) and profile information. The category .Kid stuff was named by me. The first item on my registry is a specific book. It has the Buy Online button because I supplied an Amazon URL to the book to make it easy to purchase that specific book. The below image shows what information you can attach to items. There are a few different ways to add items to the registry. 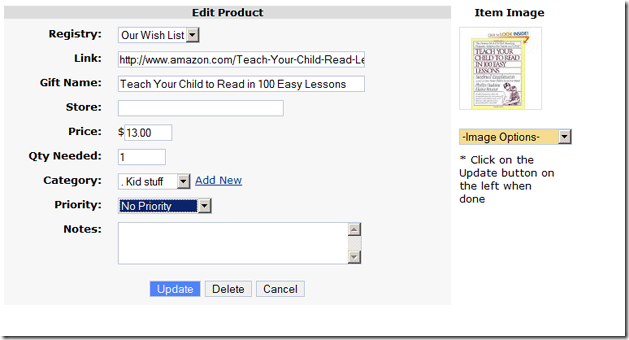 One is to manually add all the information. Another is to supply a link and let the system try to pull the appropriate information from that website. Another option is to add their “browser button” (which is just a bookmarklet) to your browser and click it when you’re on a website with an item you like. If you use either of the latter two methods, you can manually make any necessary changes to the information. This entry was posted in Great sites and tagged FindGift, gift registries, great site, wishlists. Bookmark the permalink.